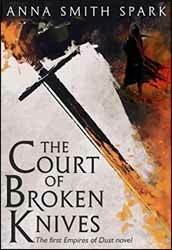 The Court of Broken Knives (2017. 468 pages) is book one of the Empires of Dust series of novels, written by Anna Smith Spark. The story is told from multiple perspectives and two different time frames, with the past gradually illuminating Marith’s backstory.